With this Feast, Christmas ends liturgically, though it continues on in spirit and as a liturgical cycle until Candlemas when we recall Mary's post-birth Purification and Our Lord's Presentation in the Temple. On this, the Octave of the Epiphany, we continue to focus on the Mysteries that entered our hearts on Twelfthnight and the Epiphany, but today more specifically with regard to the Baptism of Jesus by St. John the Baptist in the River Jordan. He Whose birth we just celebrated now shows us how to be born again or "born from above." The next day, John saw Jesus coming to him, and he saith: Behold the Lamb of God, behold Him Who taketh away the sin of the world. This is He, of whom I said: After me there cometh a man, who is preferred before me: because He was before me. And I knew Him not, but that He may be made manifest in Israel, therefore am I come baptizing with water. And John gave testimony, saying: I saw the Spirit coming down, as a dove from heaven, and He remained upon him. And I knew Him not; but He Who sent me to baptize with water, said to me: He upon Whom thou shalt see the Spirit descending, and remaining upon Him, He it is that baptizeth with the Holy Ghost. And I saw, and I gave testimony, that this is the Son of God. ...And the men of the city said to Eliseus: Behold the situation of this city is very good, as thou, my lord, seest: but the waters are very bad, and the ground barren. And he said: Bring me a new vessel, and put salt into it. And when they had brought it, He went out to the spring of the waters, and cast the salt into it, and said: Thus saith the Lord: I have healed these waters, and there shall be no more in them death or barrenness. And the waters were healed unto this day, according to the word of Eliseus, which he spoke. And Jesus being baptized, forthwith came out of the water: and lo, the heavens were opened to him: and he saw the Spirit of God descending as a dove, and coming upon him. And behold a voice from heaven, saying: This is my beloved Son, in whom I am well pleased. The voice of one crying in the desert: Prepare ye the way of the Lord, make straight in the wilderness the paths of our God. Every valley shall be exalted, and every mountain and hill shall be made low, and the crooked shall become straight, and the rough ways plain. And the glory of the Lord shall be revealed, and all flesh together shall see, that the mouth of the Lord hath spoken. And after six days Jesus taketh unto him Peter and James, and John his brother, and bringeth them up into a high mountain apart: And He was transfigured before them. And His Face did shine as the sun: and His garments became white as snow. And behold there appeared to them Moses and Elias talking with Him. And Peter answering, said to Jesus: Lord, it is good for us to be here: if thou wilt, let us make here three tabernacles, one for Thee, and one for Moses, and one for Elias. And as he was yet speaking, behold a bright cloud overshadowed them. And lo, a voice out of the cloud, saying: This is My beloved Son, in whom I am well pleased: hear ye Him. This Divine manifestation helps explain why Jesus -- the Sinless One, the Pure and Unspotted Lamb -- would be baptized at all: so that He would be known for Who He is, so that He would be made manifest. ...the baptism of John was as profitable before the baptism of Christ, as instruction in the faith profits the catechumens not yet baptized. 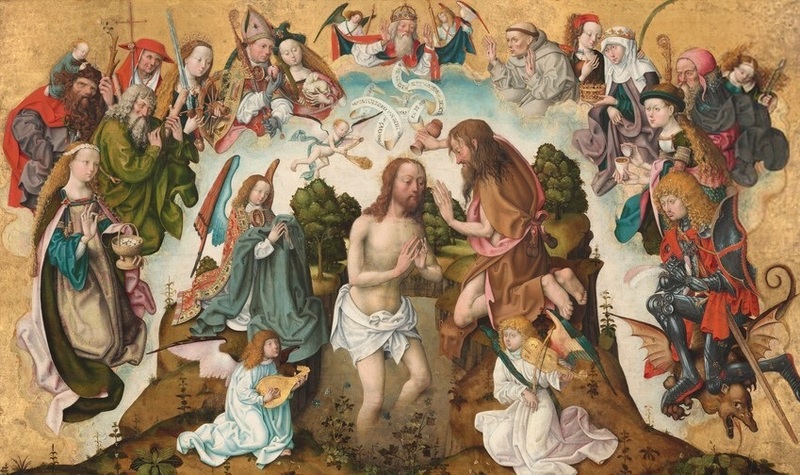 For just as he preached penance, and foretold the baptism of Christ, and drew men to the knowledge of the Truth that hath appeared to the world, so do the ministers of the Church, after instructing men, chide them for their sins, and lastly promise them forgiveness in the baptism of Christ. To give you things to think about this day, I present two hymns by St. Ephraem. The first concerns Jesus and John, and the second is here to help you appreciate your own Baptism. Response: Glory to Thee, my Lord, for Thee with joy Heaven and earth worship! 1. My thought bore me to Jordan, and I saw a marvel when there was revealed the glorious Bridegroom Who to the Bride shall bring freedom and holiness. 2. I saw John filled with wonder, and the multitudes standing about him, and the glorious Bridegroom bowed down to the son of the barren that he might baptize Him. 3. At the Word and the Voice my thought marvelled: for lo! John was the Voice; our Lord was manifested as the Word, that what was hidden should become revealed. 4. The Bride was espoused but knew not who was the Bridegroom on whom she gazed: the guests were assembled, the desert was filled, and our Lord was hidden among them. 5. Then the Bridegroom revealed Himself; and to John at the voice He drew near: and the Forerunner was moved and said of Him "This is the Bridegroom Whom I proclaimed." 7. "How, my Lord, willest Thou to be baptized, Thou Who in Thy baptism atonest all? Baptism looks unto Thee; shed Thou on it holiness and perfection?" 8. Our Lord said "I will it so; draw near, baptize Me that My Will may be done. Resist My Will thou canst not: I shall be baptized of thee, for thus I will it." 9. "I entreat, my Lord, that I be not compelled,-for this is hard that Thou hast said to me, 'I have need that thou shouldst baptize Me;' for it is Thou that with Thy hyssop purifiest all." 10. "I have asked it, and it pleases Me that thus it should be; and thou, John, why gainsayest thou? Suffer righteousness to be fulfilled, and come, baptize Me; why standest Thou?" 11. "How can one openly grasp in his hands the fire that burns? O Thou that art fire have mercy on me, and bid me not come near Thee, for it is hard for me!" 12. "I have revealed to Thee My Will; what questionest thou? Draw near, baptize Me, and thou shalt not be burned. The bridechamber is ready; keep Me not back from the wedding feast that has been made ready." 13. "The Watchers fear and dare not gaze on Thee lest they be blinded; and I, how, O my Lord, shall I baptize Thee? I am too weak to draw near; blame me not!" 14. "Thou fearest; therefore gainsay not-against My Will in what I desire: and Baptism has respect unto Me. Accomplish the work to which thou hast been called!" 15. "Lo! I proclaimed Thee at Jordan in the ears of the people that believed not and if they shall see Thee baptized of me, they will doubt that Thou art the Lord." 16. "Lo! I am to be baptized in their sight, and the Father Who sent Me bears witness of Me that I am His Son and in Me He is well pleased, to reconcile Adam who was under His wrath." 17. "It becomes, me. O my Lord, to know my nature that I am moulded out of the ground, and Thou the moulder Who formest all things: I, then, why should I baptize Thee in water?" 18. "It becomes thee to know wherefore I am come, and for what cause I have desired that thou shouldst baptize Me. It is the middle of the way wherein I have walked; withhold thou not Baptism." 19. "Small is the river whereto Thou art come, that Thou shouldst lodge therein and it should cleanse Thee. The heavens suffice not for Thy mightiness; how much less shall Baptism contain Thee!" 20. "The womb is smaller than Jordan; yet was I willing to lodge in the Virgin: and as I was born from woman, so too am I to be baptized in Jordan." 21. "Lo! the hosts are standing! the ranks of Watchers, lo! they worship And if I draw near, my Lord, to baptize Thee, I tremble for myself with quaking." 23. "I have prepared the way as I was sent:-I have betrothed the Bride as I was commanded. May Thy Epiphany be spread over the world now that Thou art come, and let me not baptize Thee!" 24. "This is My preparation, for so have I willed; I will go down and be baptized in Jordan, and make bright the armour for them that are baptized, that they may be white in Me and I not be conquered." 25. "Son of the Father, why should I baptize Thee? for lo! Thou art in Thy Father and Thy Father in Thee. Holiness unto the priests Thou givest; water that is common wherefore askest Thou?" 26. "The children of Adam look unto Me, that I should work for them the new birth. A way in the waters I will search out for them, and if I be not baptized this cannot be." 27. "Pontiffs of Thee are consecrated, priests by Thy hyssop are purified; the anointed and the kings Thou makest. Baptism, how shall it profit Thee?" 28. "The Bride thou betrothedst to Me awaits Me, that I should go down, be baptized, and sanctify her. Friend of the Bridegroom withhold Me not from the washing that awaits Me." 29. "I am not able, for I am weak, Thy blaze in my hands to grasp. Lo! Thy legions are as flame; bid one of the Watchers baptize Thee!" 30. "Not from the Watchers was My Body assumed, that I should summon a Watcher to baptize Me. The body of Adam, lo! I have put on, and thou, son of Adam, art to baptize Me." 31. "The waters saw Thee, and greatly feared ; the waters saw Thee, and lo! they tremble! The river foams in its terror; and I that am weak, how shall I baptize Thee?" 32. "The waters in My Baptism are sanctified, and fire and the Spirit from Me shall they receive; and if I be not baptized they are not made perfect to be fruitful of children that shall not die." 33. "Fire, if to Thy fire it draw near, shall be burnt up of it as stubble. The mountains of Sinai endured Thee not, and I that am weak, wherein shall I baptize Thee?" 34. "I am the flaming fire; yet for man's sake I became a babe in the virgin womb of the maiden. And now I am to be baptized in Jordan." 35. "It is very meet that Thou shouldst baptize me, for Thou hast holiness to purify all. In Thee it is that the defiled are made holy; but Thou that art holy, why art Thou to be baptized?" 36. "It is very right that thou shouldst baptize Me, as I bid, and shouldst not gainsay. Lo! I baptized thee within the womb; baptize thou me in Jordan!" 37. "I am a bondman and I am weak. Thou that freest all have mercy on me! Thy latchets to unloose I am not able; Thy exalted head who will make me worthy to touch?" 38. "Bondmen in My Baptism are set free; handwritings in My washing are blotted out; manumissions in the water are sealed; and if I be not baptized all these come to nought." 39. "A mantle of fire the air wears, and waits for Thee, above Jordan; and if Thou consentest to it and willest to be baptized, Thou shall baptize Thyself and fulfil all." 40. "This is meet, that thou shouldst baptize Me, that none may err and say concerning Me, 'Had He not been alien from the Father's house, why feared the Levite to baptize Him?' "
41. "The prayer, then, when Thou art baptized, how shall I complete over Jordan? When the Father and the Spirit are seen over Thee, Whom shall I call on, as priest?" 42. "The prayer in silence is to be completed: come, thy hand alone lay thou on Me. and the Father shall utter in the priest's stead that which is meet concerning His Son." 43. "They that are bidden, lo! all of them stand; the Bridegroom's guests, lo! they bear witness that day by day I said among them, 'I am the Voice and not the Word.' "
44. "Voice of him that cries in the wilderness, fulfil thou the work for which thou camest, that the desert whereunto thou wentest out may resound with the mighty peace thou preachedst therein." 45. "The shout of the Watchers has come to my ears; lo! I hear from the Father's house the hosts that sound forth the cry, 'In Thy Epiphany, O Bridegroom, the worlds have life.' "
46. "The time hastes on, and the marriage guests-look to Me to see what is doing. Come, baptize Me, that they may give praise to the Voice of the Father when it is heard!" 47. "I hearken, my Lord, according to Thy Word: come to Baptism as Thy love constrains Thee! The dust worships that whereunto he has attained, that on Him Who fashioned him he should lay his hand." 48. The heavenly ranks were silent as they stood, and the Bridegroom went down into Jordan; the Holy One was baptized and straightway went up, and His Light shone forth on the world. 49. The doors of the highest were opened above, and the voice of the Father was heard," This is my Beloved in Whom I am well pleased." All ye peoples, come and worship Him. 50. They that saw were amazed as they stood, at the Spirit Who came down and bare witness to Him. Praise to Thy Epiphany that gladdens all, Thou in Whose revelation the worlds are lightened! Response: Brethren, sing praises, to the Son of the Lord of all; Who has bound for you crowns, such as kings long for! 1. Your garments glisten, my brethren, as snow; and fair is your shining in the likeness of Angels! 2. In the likeness of Angels, ye have come up, beloved, from Jordan's river, in the armour of the Holy Ghost. 3. The bridal chamber that fails not, my brethren, ye have received: and the glory of Adam's house today ye have put on. 4. The judgment that came of the fruit, was Adam's condemnation: but for you victory, has arisen this day. 5. Your vesture is shining, and goodly your crowns: which the Firstborn has bound for you, by the priest's hand this day. Woe in Paradise, did Adam receive: but you have received, glory this day. 7. The armour of victory, ye put on, my beloved: in the hour when the priest, invoked the Holy Ghost. 8. The Angels rejoice, men here below exult: in your feast, my brethren, wherein is no foulness. 9. The good things of Heaven, my brethren, ye have received: beware of the Evil One, lest he despoil you. 10. The day when He dawned, the Heavenly King: opens for you His door, and bids you enter Eden. 11. Crowns that fade not away, are set on your heads: hymns of praise hourly, let your mouths sing. 12. Adam by means of the fruit, God cast forth in sorrow: but you He makes glad, in the bridechamber of joy. 13. Who would not rejoice, in your bridechamber, my brethren? for the Father with His Son, and the Spirit rejoice in you. 14. Unto you shall the Father, be a wall of strength: and the Son a Redeemer, and the Spirit a guard. 15. Martyrs by their blood, glorify their crowns: but you our Redeemer, by His Blood glorifies. 16. Watchers and Angels, joy over the repentant: they shall joy over you my brethren, that unto them ye are made like. 17. The fruit which Adam, tasted not in Paradise: this day in your mouths, has been placed with joy. 18. Our Redeemer figured, His Body by the tree: whereof Adam tasted not, because he had sinned. 19. The Evil One made war, and subdued Adam's house: through your baptism, my brethren, lo! he is subdued this day. 20. Great is the victory, but today you have won: if so be ye neglect not, you shall not perish, my brethren. 21. Glory to them that are robed, glory to Adam's house! in the birth that is from the water, let them rejoice and be blessed! 22. Praise to Him Who has robed, His Churches in glory! glory to Him Who has magnified, the race of Adam's house.